I just received a question from Dave about the use of compression stockings after heart surgery. While I can not speak for all patients, I can assure Dave that when I woke up in the intensive care unit, I was wearing compression stockings after my heart valve surgery. Like the ventilator tube, this was not expected. However, I didn’t find the stockings to be annoying or irritating. After the surgery, I was thrilled to be alive. That said, I was pretty accepting of all the medical gizmos that were either on me or surrounding me. I would later learn that these stockings are medically referred to as compression stockings. I hope this helps Dave (and perhaps you) manage your expectations specific to the use of compression stockings after heart surgery. My husband had an aortic valve replaced and mitral valva repaired. He was not wearing stockings after surgery and never required to do so. My husband had his mitral valve repaired at Kaiser Sunset in Southern California almost one year ago and he never wore compression stockings as a part of his recovery. Thanks for sharing your husbands experiences. This is very interesting to learn of the different approaches following cardiac surgery. I had tricuspid valve replacement surgery and did have to wear the compression stockings after surgery, but like Adam, did not find them to be annoying either. I was also glad to be alive and with all the tubes, etc., to deal with, I’d say the stockings are the least of your worries. Hey Adam, how are you doing? Always enjoy getting your e mail. Boy, all I can say is that Dave’s friend is focusing on something pretty minute. ?? Believe me Dave, if your surgical stockings are the thing that annoy you the most you will have had a great time in the hospital! The stockings are fine and they certainly didn’t bother me. I had them for another surgery some years ago and wondered what they were, had them on all night after surgery. They make sure your blood is circulating! I had them on for about 3 days in the hospital after open heart mitral valve repair surgery but I was more aware of the IVs, the constant barrage of people in and out to take tests and blood, the lousy TV set (LOL) the noise in the hall, the blood transfusions (2) and the heparin due to going into atrial fib (which resolved itself in a day). Surgical stockings? Not a big deal, Dave!! Good luck and know you are going to do great! I had mitral valve surgery 6 months ago and in the ICU woke up with those band type things that were programmed to squeeze my lower legs every so often. No-one saw them- but they were definitely not so feminine. They did not bother me at all- and I slept with them on just fine (I am a light light sleeper usually). I did not wear anything on my legs after I went to the regular cardiac ward. Even if you have stockings on- you won’t care. Evey time I asked a question about how I would look, what clothes ,shampoo, etc- the answer I got from a friend who had been through it was “You won’t care!” And I found that to be true. I had mitral valve repair in December 2009, and I did not have to wear stockings. Right after the surgery, my biggest concerns were not sneezing (it hurts like hell after having your lung shut down), sucking on that little plastic thing with 3 balls and trying to get all of the balls high up in the tube (also uncomfortable), and walking as much as they wanted me to right after my surgery and dealing with being really, really tired from it. Overall, the surgery went very well and being in the hospital was the easy part. The recovery since then and not being at 100% yet has been the hard part. Dave and Adam: I can handle the stockings. I have the same conditions plus atrial fibrillation and hoping for mitral valve repair and possibly “maze” procedure. Am I a candidate for MICS or am I looking at full Sternum split?? Thanks. I had a mitral valve repair in January 2010 at Florida Hospital Orlando. During my early recovery, I had the compression stockings on sometimes. But I learned that my surgeon, Dr. Accola, was not a big fan of them. And since I was immediately very ambulatory (I walked the corridors for miles, literally), I was not forced to wear them. It really wasn’t that big a deal, but if you want to avoid the stockings, you’ll increase your chances by walking, walking, walking. I\’ve decided to take a little break from the compression stockings? during my hospital stay they didn\’t tell me to take them off on day so i wore them 24hrs. now, since i\’m not walking anywhere i took a day? what does anyone think? ff helped me in any way they could. I knew I was there for life saving surgery, so I didn’t expect it to be a ‘walk in the park”. My operation was a success and after a Cardioversion and a cardiac Ablation all is going well. 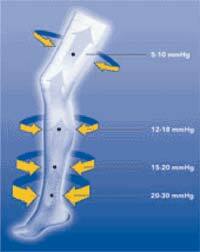 I am currently wearing compression stockings to alleviate fluid retention. Going well so far.